Broken Legions: Fantasy Skirmish Wargames in the Roman Empire by Mark Latham is one of the latest in the Osprey wargames series from Osprey Games. I’ve really been enjoying… well… most of the games in this series. They’re inexpensive enough that I don’t mind picking them up just to see what they’re like. I’ve been pretty excited about checking out Broken Legions for almost a year now since the Big Reveal last September. Not because I had a clue who Mark Latham was at the time or what sort of rules he’s written (though BGG informs me he is the author of Trafalgar, Waterloo, and the Legends of the Old West series of games - all from Warhammer Historical Wargames – of which I have only played Legends of the Old West, once, almost 10 years ago), but I really like the thematic setting. I really like Cthulhu Invictus. I had though about running it with Savage Worlds back when I was playing a lot of that, but never got around to it (too many campaign settings… not enough time… or regular committed players) (you’d think I’d have been all over Weird Wars Rome, but I’m actually kind of “meh” about it…). I thought at one point I might try running them using a mash up of Song of Shadows and Dust and Fear and Faith… and I still might! But I also thought I’d have a look at Broken Legions to see how they played out and if they could potentially be adapted. I recruited the kids to play a quick game Friday afternoon. Centurion Carisius and his sacred band of Legionaries are on a mission deep into the heart of Germania to recover ancient relic the barbarians there might use to gain great power. I tried to keep things relatively simple – not try out too many different things in our first go at this. I also wanted to try and just use stuff that I had… which didn’t necessarily fit the lists exactly, but I did my best. Germans, being the attackers in the particular scenario, automatically started with the initiative. In the darkest hour before dawn, the Romans are up in their camp – alerted to the presence of ambushers by the vicious barking and howling of the Centurion’s loyal canine companion; Rex. The Druidess accompanied by her bodyguard approach the camp from one direction. 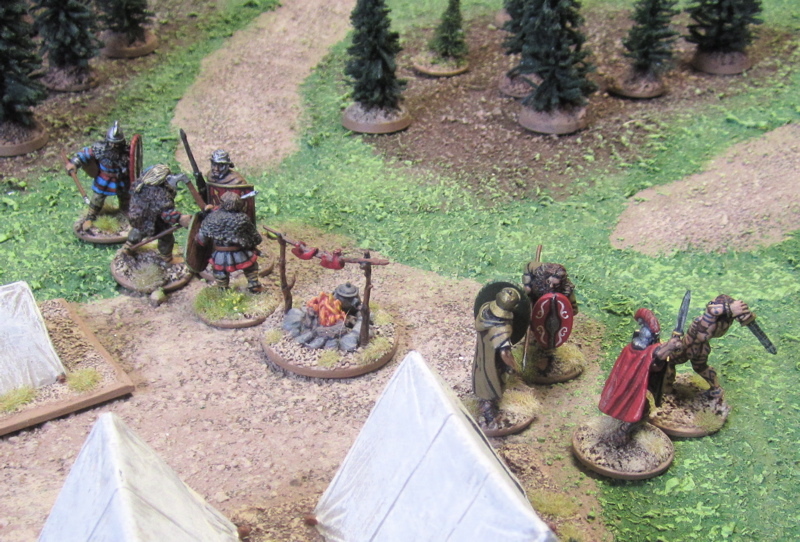 The Tribal Chieftan led another bunch towards the camp from the opposite direction. 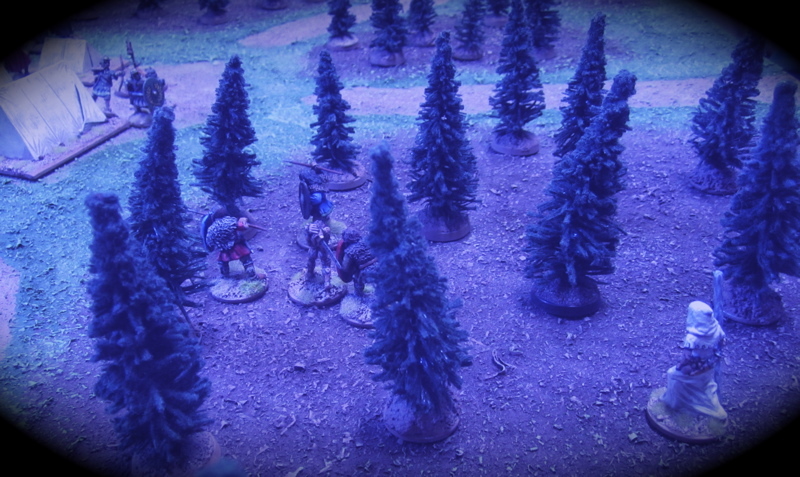 The Tribal Chieftan was spotted in the darkness by one of the archers who loosed off an arrow at him, missing. Another archer joined him but couldn’t make out any targets. The Legionaries also rushed to that side of the camp, leaving the other side guarded by the solitary Auxiliary soldier, and single archer and Rex, the Centurion’s warhound. 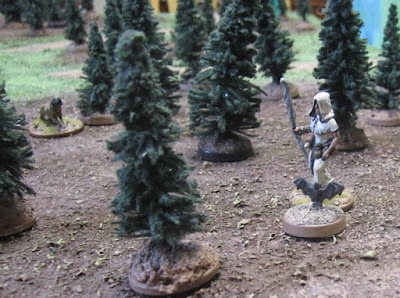 The Druidess and her companions advance through the woods – at the end of her movement the Druidess performed the Nature’s Wrath miracle – all enemies within 3” of any woods or swamp or similar feature had to make a Physique Test at -1 or take a wound – this was particularly nasty because nearly all of the table is forest! 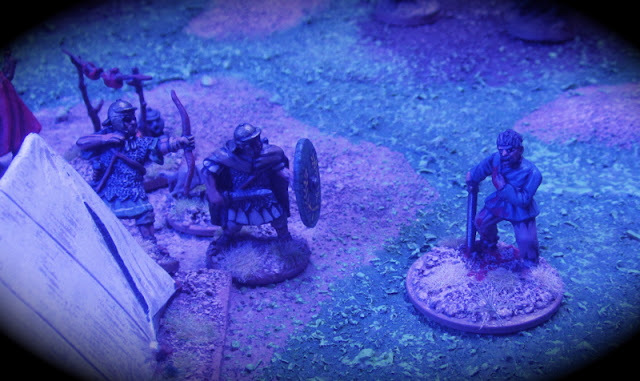 The Romans lost two of their archers and three of the Legionnaires took wounds! This was a pretty devastating blow for the Soldiers of the Eagle – and on the first turn – What if she did that EVERY turn!? To perform a miracle they simply have to pass a Presence Test (d10+Presence=10+ for success – with a presence of 4 that means it works 50% of the time… brutal…). No sunrise, darkness rules still in effect. Germans continued to have the initiative. The Germans continued to advance. 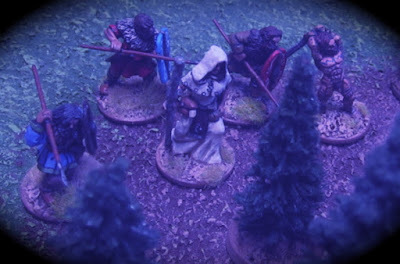 As the Centurion finally spotted the Germanic Tribal Chieftain lurking in the shadows, he decided to take the “Bring Him Down” Heroic Action – thus for the remainder of the turn anyone in his warband that was able to spot the Tribal leader in the darkness and made a missile attack on him did so at +1. So all the Legionaries rushed forward and threw their Pilums at the Tribal Chieftain. The Germanic warriors also rushed forward and hurled their javelins at Legionnaires that hadn’t yet thrown their Pilums – on got lucky at took down a Legionnaire that had previously been wounded by the Nature’s Wrath miracle. Three of the Legionnaires hit the Chieftain, but he deflected all three in turn with his shield (they failed to wound). 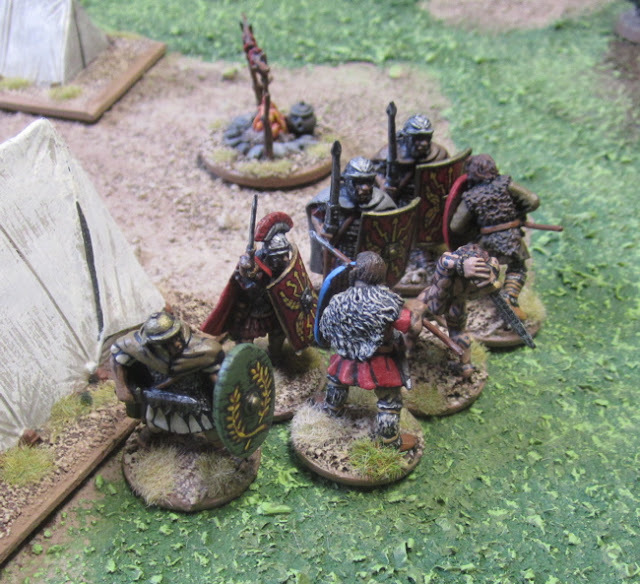 At the end of their move three had formed up into a shieldwall. Germans still advancing towards the other end of the camp. The Druidess failed to perform any miracles this round and narrowly escaped the Wrath of the Gods! No sunrise, darkness rules still in effect. Germans continue to maintain the initiative. Worried the Druidess might pull off another Nature’s Wrath miracle, the Centurion ordered his men back into the relative safety of the camp. 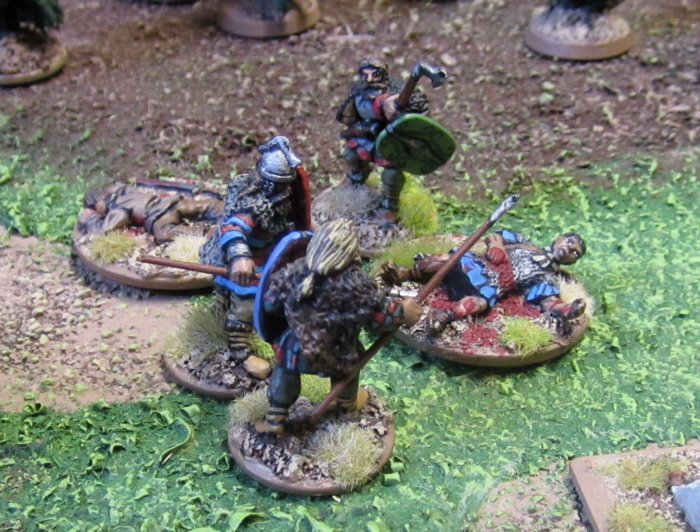 Two made it back, but the third was charged by two Germanic Warriors – locking him in combat and preventing his retreat. At the other end of the camp a Germanic Warrior charged out of the woods and hurled his javelin at the Auxiliary soldier – missing wildly. The Archer put an arrow through him – knocking him out of the action. 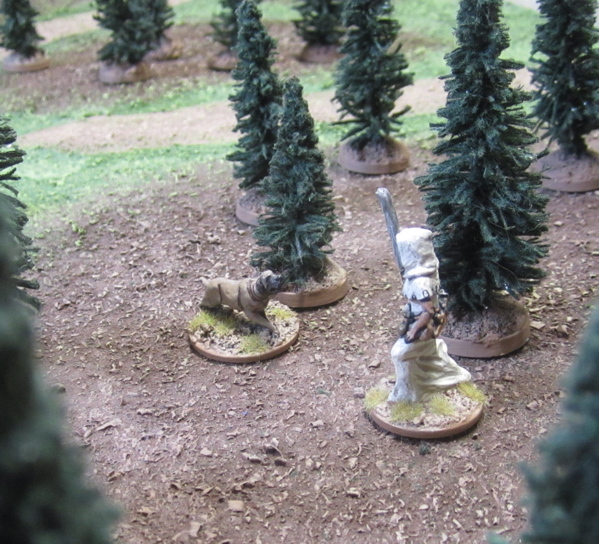 A second warrior broke from the trees and this one hurled his javelin at the Archer – taking him down! The Berserker joined the other two. In the melee phase the two Germanic Warriors hammered on the lone Legionary. 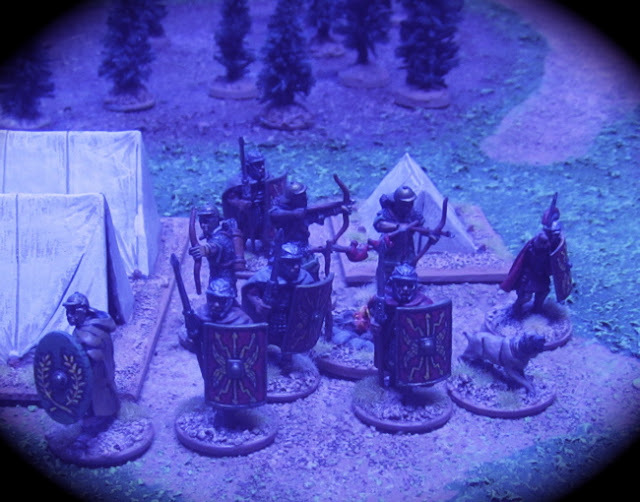 Despite their numerical advantage and the charge bonuses – they just couldn’t take down the Legionary – Heavy Armour with a Tower Shield is one tough nut to crack… best to stick to the miracles, because a regular warrior is just not going to take one out unless he gets very lucky! 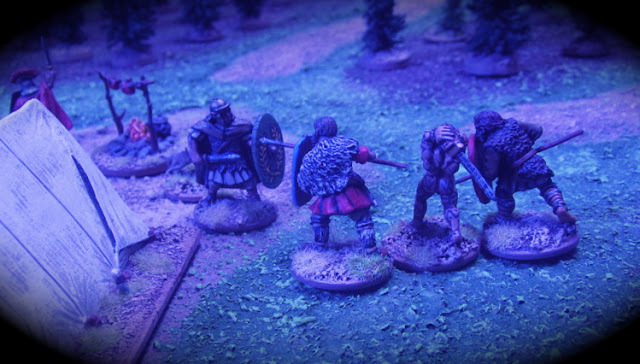 Sun came up, darkness rules no longer in effect – and the Romans seize the Initiative! The Centurion Charged into combat against one of the Germanic Warriors and shouted at his men “TO ME, MEN!” (another “heroic action” that allows D5 of his soldiers within 6” to immediately activate and move towards him – they used this to great effect, forming a shield wall on his flanks. The rules about these shield walls and charging them aren’t totally clear. Three or more soldier with shields and the Shield wall special ability may form a shield wall simply by moving into line and facing in the same direction – then, in addition to the benefit of the shields themselves, they also count as defending an obstacle. Now if they are charged from the side or rear, soldiers can be peeled off that shield wall and if enough of them do so it is no longer in effect. It SEEMS, though it doesn’t specifically state it, that when charging an enemy a model is to move directly towards it – otherwise why wouldn’t everyone charge immediately to the flank of it and break up the shield wall. So we said if models wanted to charge the side, they’d first have to move far enough over to the side – so that the closest direct path would be to their flank. 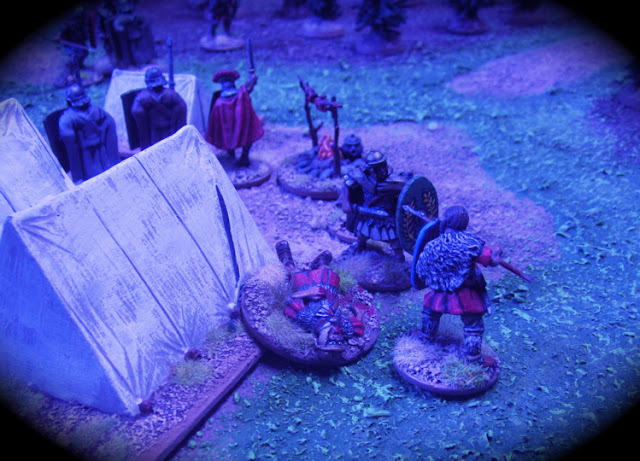 Despite that option, the Germanic warriors just charged straight in against the wall! Rex the warhound charged into the wood in search of the sorceress – he can sniff out evil magic! 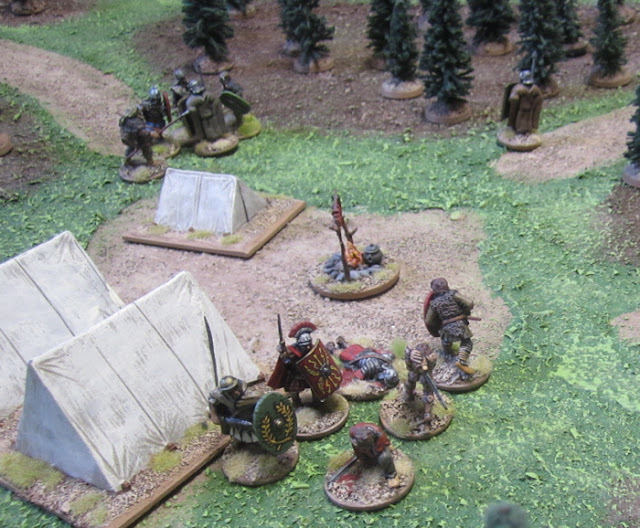 The Shieldwall looked particularly nasty… until the Melee Phase. Of those that charged, the Berserker had the highest agility and went first attacking a legionary to his front in the middle of the shield wall… and took him down! Now it doesn’t really specifically say when the ability is lost, but it seemed the wall was broken up and so it should no longer apply…? The Auxiliary at the end of the line didn’t get to hit anyone. 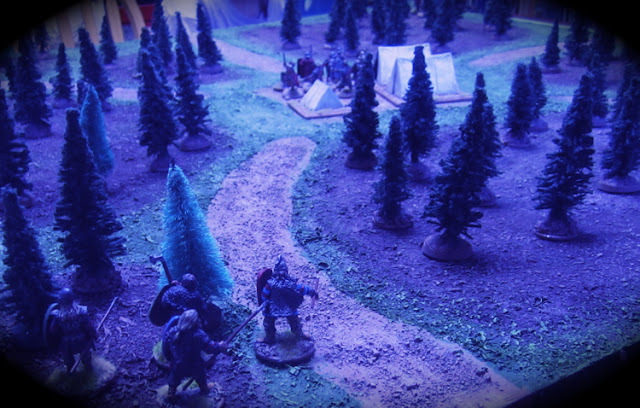 One of the advantages of the shieldwall is that anyone in the shieldwall may participate in a melee and may direct their attacks at anyone in contact with the wall (which seems a little odd as a soldier at one end, it seems, could direct his attacks at an opponent in contact with soldiers at the far end of the line…? Anyway, as there no longer was a shield wall and the Auxiliary was never actually in contact with the opposing Germanic Warriors… he didn’t get to get in on the action. 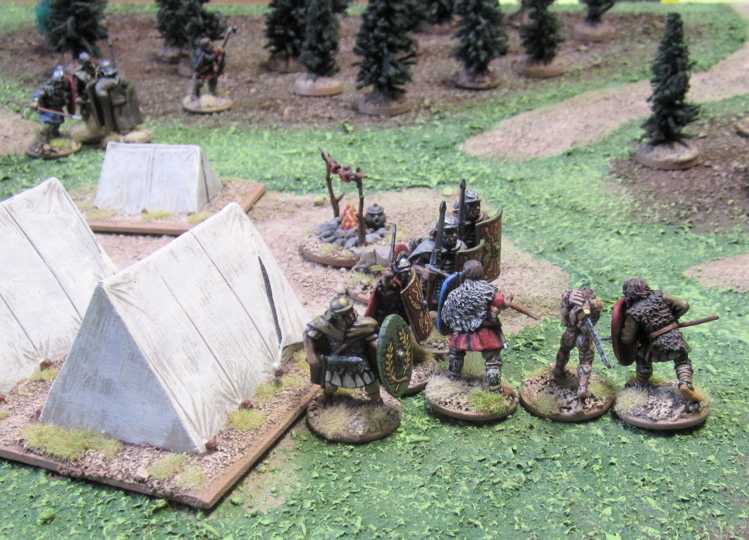 Over at the other end of the camp the Tribal Chieftain and a third Germanic Warrior had joined in the melee against he solitary Legionnaire defending that end of the camp. 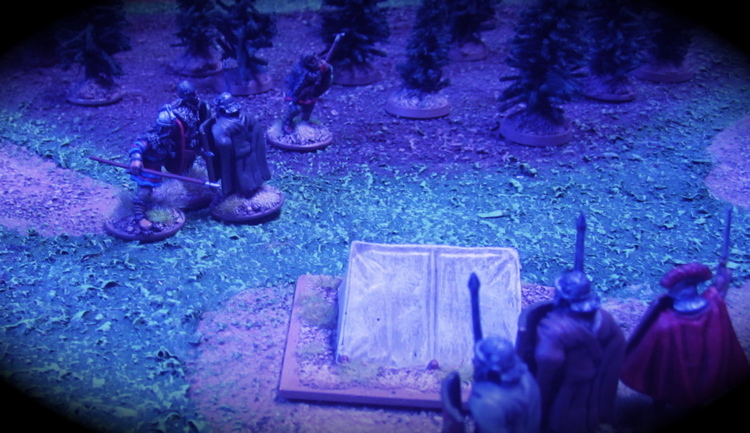 He tried to sell himself dearly – and managed to take down one of the barbarians – the numbers finally took their toll and the Legionary was brought down. The Romans won the initiative. So the Druidess used the Spy special ability that her raven/bat gave her and tired to reverse that. It didn’t work. The Centurion charged into combat against the Berserker – thinking he’d have a better chance against it than the Auxiliary that was with him… and by charging the Berserker it prevented the Berserker from getting the bonus attack he gets every round in which he charges. There is a bit of a campaign system – which is always fun – but we only went as far as rolling to se what became of those injured in the game…. Of the Germans only one of the Warriors died. All things considered it was a pretty fun game and we didn’t get bogged down having to look up rules or anything. It would probably go even a bit quicker after a few more plays. I can’t seem to wrap my head around the campaign system. It seems experience point are gathered individually based on who took out what stuff and whether your side won. 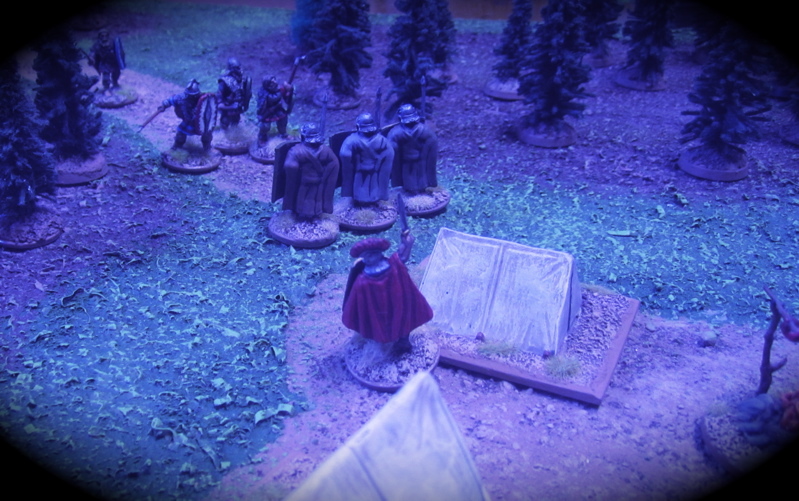 The Soldiers of the Eagle, having only taken out 4 henchmen and lost the game would have gained ZERO experience points. The Barbarians, on the other hand, would have gained 8… or maybe 11…? Now these experience points can be saved and when individuals gain enough (3 for henchmen and 5 for Heroes) they can “spend” them to roll on a table for a chance at some sort of benefit. The points can alternatively be pooled and converted into points to recruit new members for the warband… I just can’t grok the economy of it all. It seems like it would be really, REALLY hard to just keep the numbers you have let alone expand your warband and have the experienced gain new abilities…? I guess I’d have to play it and see how it worked out. There are Auxilia – mercenary heroes you can hire for your warband – which I didn’t bother with for this game. They have a point cost to hire them at creation or to add to your warband later, but they also have retainer you have to “pay” in points EVERY GAME to keep them!? I’m not sure how you’d be able to keep then around without wiping out your opponents every game and not ever giving your guys any advances…!? Again I guess I’d have to play more to see if it works out. If I didn’t have loads of other games I like better I’d totally play this more. It’s a slick little game that plays fairly quick and has some fun elements and a campaign system and with a few rules clarifications and/or house rules to clarify things it would make a fine little game…. Could be a post about our annual 30 Games in 30 Days September Challenge (Broken Legions was Game #2 for the 2nd of September…) or possibly pics of the next Battalion of Canadians I’m just finishing up – YES they are a battalion that I need for the Regina Trench game!! I AM doing some work on that!! That looks awesome - I'll have to check it out - Thanks! FWIW I think your shieldwall rulings make a lot of sense. And a Presence check for be wounded by a miracle should happen. Seems like every other wound causes a check. I kind of like the idea of the shieldwall. They seemed pretty daunting when I first read through the rules for them, but when we played they aren't so bad. As the shieldwall has to stand still they will always be charged and there are advantages to charging which offset the barrier they are fighting over. Also, as it turned out in our game, if you can take down someone in the middle it would seem the wall instantly falls apart - though that may not always be so easy as it was in our game. It seems, in the open at least, it would be pretty easy, for a patient player, to outflank the wall and THEN charge - if playing in a confined space (city streets) it could be slightly more effective. 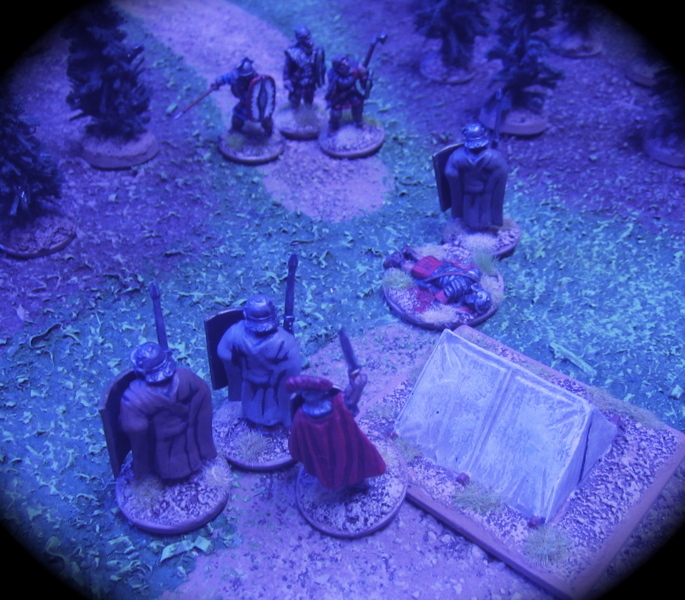 The lack of clearly stating where and how to charge could lead to arguments among the more lawyerly players about whether a model can charge from the front directly to a legionnaires flank - thus peeling him of the shieldwall. We read through the charge procedure twice and decided that what it probably intended is that a charging model has to charge using the straightest path to get to it's intended target (though it doesn't specifically state this) and so if you want to outflank a wall, you first have to move to a spot where you are clearly on the flank and then charge on a later turn. Also the fact that any of the soldiers in the shield wall can direct their attacks against anyone in contact with the shield wall seems a bit odd. When defending a barrier is states that anyone within 1" on the other side of the barrier can be considered in combat and targeted. But with this as stated it seems that if there were five guys lined up in a shield wall, a guy at one end could attack an opponent that is in contact with a legionnaire at the exact opposite end - which could be 4" away!? I get the idea behind it - giving those in a shield wall some advantage for being in said formation - but it seems a rather big abstraction in a game that is pretty straightforward and otherwise lacking in that sort of abstraction. Are you sure it doesn't mean within 1" and on the other side of the barrier (so, for a shieldwall within 1")? I can't see a shiedwall giving an offensive advantage like that. Maybe allowing a second rank of the shieldwall to attack, that makes some sense with how I view a shieldwall to work. But extended range (or situational mobility doesn't seem right). At least you know what clarifications are needed if/when you play again. So, more Canadians you say? 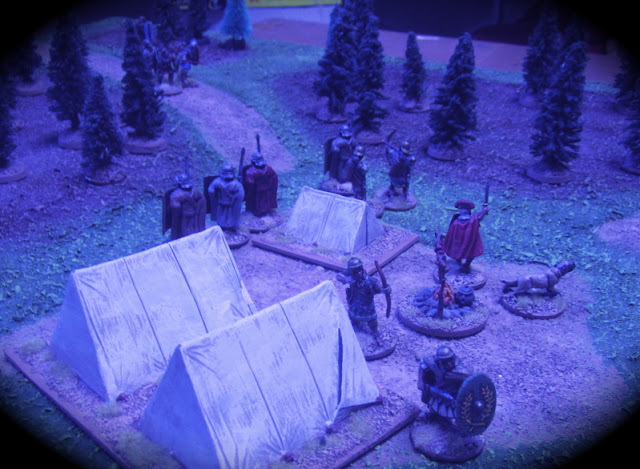 What is says is "When attacked from the front in close combat, every model in the shieldwall counts as defending a barrier. They are not separated when attacked from the front - the models remain in a solid line, and any model in the line may allocate an attack action against any enemy in contact with the frontage"
Of course this would all require a fair few figures all concentrated in one area (when warbands are supposed to be 6-12 figures). Yes, Canadians. Working on one of the battalions in the 3rd Brigade - the one battalion in that brigade that WASN'T a highland unit... the 16th Battalion, I think..? Originally raised in Montreal, if I remember correctly...? Hey Tim - just found this old post of yours, which is really cool. Sounds like a very fun narrative type of game. Nearly a year on from it, have you thought about playing it again? The idea and genre sound really interesting. 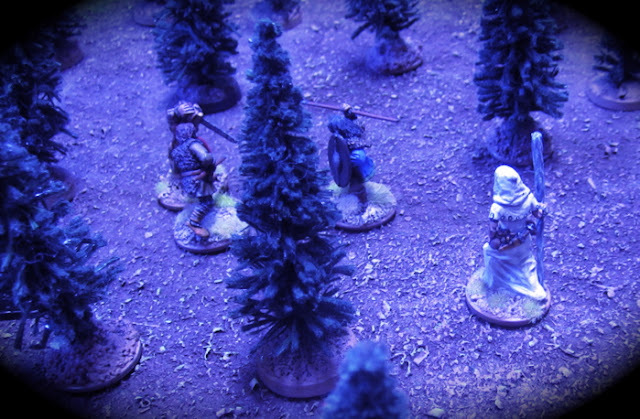 Rules aside, your figs and terrain are excellent (love the Druidess figure - who makes that?). I particularly liked the way you colourised the pre -dawn images - very cool. I have to admit I have not played it since. Not because it wasn't a good game. More because... well... too many games, too little time. If I were to play this again I'd probably just use Song of Blades and Heroes (or one of the games using the same engine) simply because I'm more familiar with it. Probably mash-up Song of Shadows and Dust with Fear and Faith. I can't remember the maker of the druidess... I picked it up off of eBay ages ago. It came in a pack with two others presumably the same druidess in different stages of her career - there was a whole series of them - "Three Stage Heroes" or Three Stage Adventurers" or something like that...? Might have been Mega Miniatures at the time that had the rights to manufacture and distribute them, but I think they've been available elsewhere, I just can't think of where I've seem then. Sorry I can't be more help!